BONE GAP is not really about bees, in case you were wondering. That cover is striking though, isn't it? As soon as I saw it, I knew I had to read the story within. They say not to judge a book by its cover, but in this case I'm glad I did. In BONE GAP, I found warm honey and whispering corn fields. A magical midnight horse and a goat that says "meh." Two boys who have lost so much that they believe everyone and everything will leave them. A stunningly beautiful young woman with a gift for making things grow. The mysterious shadow of a man who kidnaps her. And the bee-faced girl with long legs, a sharp tongue, and a tender heart. Perhaps nothing that came out of her mouth was as interesting to him as the mouth itself. One of the many themes that author Laura Ruby explores in BONE GAP is the objectification of women. Roza is not kidnapped because she is capable and clever and kind. Roza is kidnapped because she is pretty. She is seen as a thing to be had, not a person to know, understand, or appreciate. Her beauty is a double-edged sword, but she is the one facing the pointy end. A pretty face is just a lucky accident. Pretty can’t feed you. And you’ll never be pretty enough for some people. Petey (Priscilla) is not lovely -- not in the traditional sense anyway. The way that people dehumanize her is different from the way they objectify Roza -- it's motivated by distate rather than desire -- but it's the other side of the same coin. Petey is still reduced to a body, a face. But wasn’t that love? Seeing what no one else could? "They" say that love is blind. Laura Ruby suggests that love allows us to see -- more clearly, more brightly, more honestly -- a person's invisible qualities, their hidden beauty and value. So who is correct, "they" or Ruby? I say both. I say that more than one thing can be true at the same time. Even if those things seem, at first, to be contradictory. BONE GAP is filled with nuanced thinking of this sort. It's a story for readers who are not afraid of tough, interesting questions (and occasionally tough, interesting answers). Readers who want to go on a magical journey right here in the real world. Readers who are willing to slip between the cracks of what's known in order to explore the things that could be. 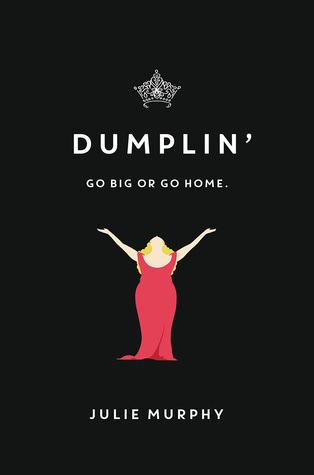 Another book with similar themes that we are really looking forward to reading is DUMPLIN' by Julie Murphy. Look how cute that cover is! Obviously the tone of this book is going to be pretty different from BONE GAP -- and that's a good thing. We need all kinds of stories, all kinds of beauty. PS: For more YA quotes that we love, check out weheartya.tumblr.com. Ooh, I totally agree! I recently read Bone Gap and was struck by the nuance. I definitely also picked up on the objectification of women, but in a different sense because I thought Finn as a sort of male counterpart to Roza (in the sense that he is supposedly very good looking too, but he isn't abused like Roza is, which says something about the different ways men and women are treated in our society). I'm a little tired right now so I'm sorry if that doesn't make much sense, but I'm curious to see what you girls think of Dumplin'. Oh wow! 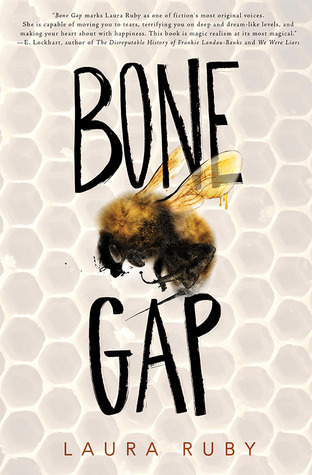 I seriously need to pick up my copy of BONE GAP soon–it sounds absolutely lovely and I’m so happy you enjoyed it. Love your buzz for this book :D I should start DUMPLIN’ as well...really looking forward to it!